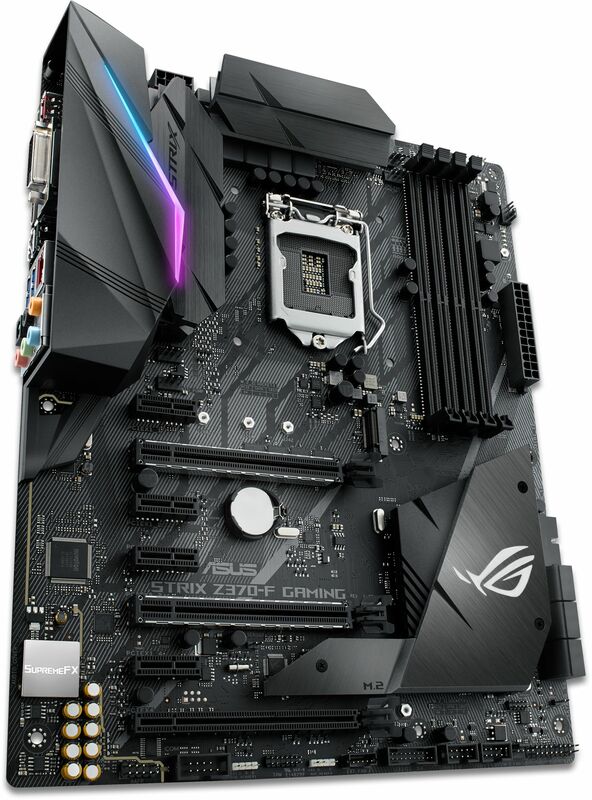 The ASUS ROG Strix Z370-F Gaming motherboard supports 8th Generation Intel Core i7 / i5 / i3 processors in the LGA1151 package and has two 32GB/s M.2 slots. With aesthetics inspired by the sharpest blades and premium colorways to match any mood, the all-new ROG Strix Z370 motherboards are ready to do battle and infused with all the essential ROG engineering needed to push performance as far as you dare. Ready for the latest 8th Generation Intel Core processors, ROG Strix Z370-F Gaming is loaded with overclocking and cooling innovations to keep your rig's thermals in check as you turn up the clock. Factor in custom Aura RGB illumination and superior SupremeFX audio and you'll know that ROG Strix Z370-F Gaming looks great and sounds amazing. ROG Strix Z370-F Gaming rocks core ROG features to help you max out all aspects of system performance, handing you the tools needed to realise your system's true potential. Dual PCIe 3.0 x4 M.2 slots provide NVMe SSD RAID support for an incredible performance boost. Create a RAID configuration with up to three PCIe 3.0 storage devices via two M.2 slots and a PCIe x16 slot to enjoy the world's fastest data-transfer speeds. 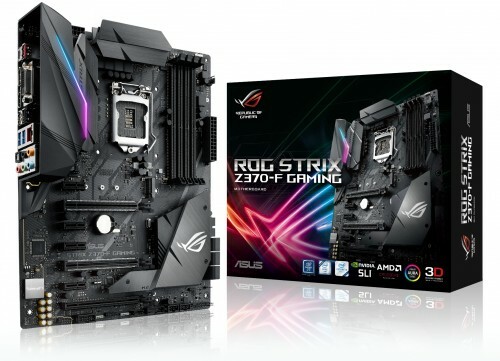 With ROG Strix Z370-F Gaming you have comprehensive control over fans and all-in-one (AIO) coolers, via either Fan Xpert 4 or our media-acclaimed UEFI. Whether you're cooling with air or water, Auto-Tuning mode intelligently configures all parameters with a single click. There's also an Extreme Quiet mode, which reduces all fan speeds to below the default minimum keeping your system whisper-quiet when performing light tasks. ASUS OptiMem preserves memory signal integrity by routing memory traces and vias to the optimal PCB layer, and our T-Topology layout ensures time-aligned signalling by balancing trace lengths between memory slots. These enhancements lead to more headroom for overclocking and improved stability, allowing memory speeds of DDR4-4000 and beyond with all slots populated. A dedicated base-clock generator designed for 8th Generation Intel processors allows overclocked base base-clock frequencies up to or beyond 432MHz. This custom solution works in tandem with the ASUS TurboV processing unit to enhance voltage and base-clock overclocking control providing an exciting new way to boost performance to extreme heights. ROG Strix's SupremeFX audio technology has levelled up, delivering an exceptional 113dB signal-to-noise ratio on the line-in connection for best-ever recording quality and 120dB on line-out for crystal-clear sound! We've also added a low-dropout regulator for cleaner power delivery to the SupremeFX S1220A codec, plus Texas Instruments RC4580 and OPA1688 op-amps for high gain with low distortion. It all adds up to audio that envelops you as never before! ROG Strix Z370-F Gaming features a pair of onboard 5050 RGB headers and an addressable RGB header that can be connected to compatible lighting strips, fans, coolers, and PC cases, creating a new world of illumination possibilities.